I hadn't really planned on making my own pate, but when I saw a half pound container of chicken livers on sale for only 50 cents, it was just too good of a deal to pass up. I also knew that I wanted to make a savory pate with a Vietnamese flavor since I wanted to add it to banh mi (Vietnamese sandwiches). So that meant omitting the usual French seasonings of thyme and other herbs. I soaked the chicken livers overnight in soy milk (although regular milk would work fine too) to cut down on the liveriness, if you will. 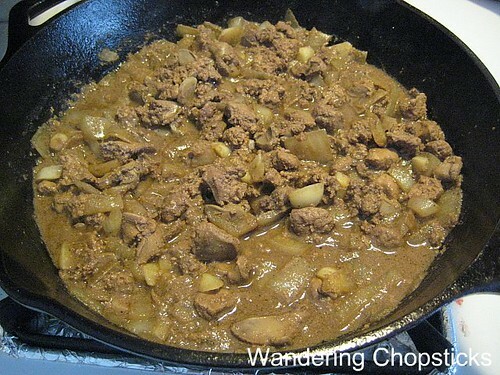 I added a stick of butter to mix with the cooked livers to cut down even more of the liveriness. The result was a nice, buttery smooth flavor. Half a pound of livers doesn't seem like a lot but this recipe makes enough for three or four ramekins. I gave some away and froze the rest. The pate will keep in the fridge for about a week. I know you like the step-by-step photos but even I have my limits and raw chicken liver is soooo not appetizing. So first, wash the chicken livers and remove any excess white or yellow membrane stuff or whatever that is. Wash again. Sprinkle 1/2 tsp salt over the chicken livers and mix thoroughly. Then pour enough soy milk or regular milk over the livers to cover. Refrigerate overnight. The next day, rinse the livers and chop into smaller pieces. Set aside. Saute one small diced onion and six cloves of garlic. Don't worry if they aren't too uniform as everything gets pureed anyway. 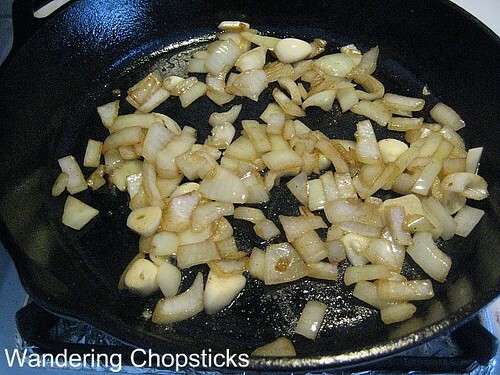 When the onions have slightly softened, add the chopped livers and 1/2 cup white wine. Saute until cooked and continue simmering for another 5 minutes or so until liquid reduces. Add 1/2 tsp salt, 2 tsp fish sauce, and 1/2 tsp ground black pepper. Taste and season if necessary. Then set mixture aside to slightly cool. 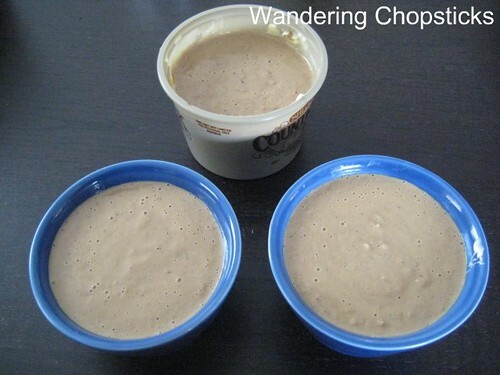 When the liver mixture has cooled enough, but is still warm, puree in a food processor. 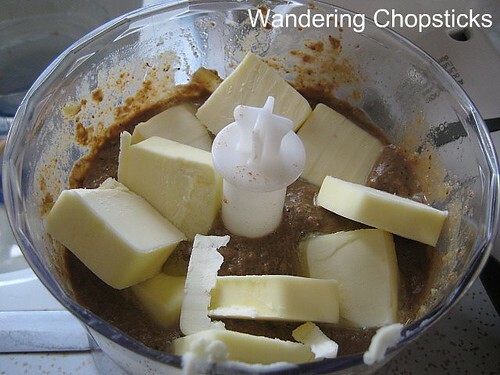 Chop one stick of butter into big chunks and add that to the food processor. 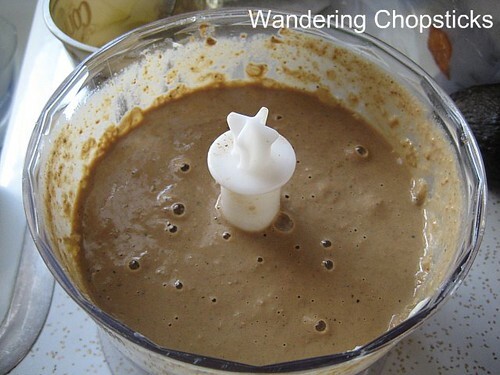 The butter should easily melt and blend with the warm liver mixture. Pour into ramekins. 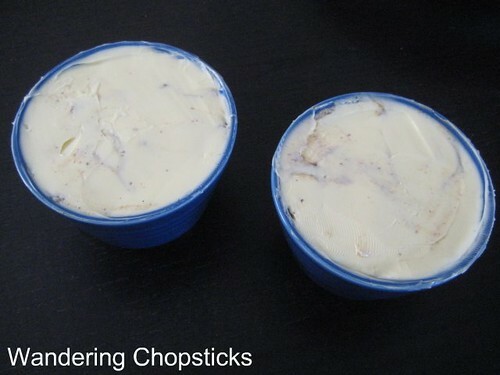 I poured mine into two ramekins and one small plastic container to freeze for later. Put the pate into the fridge for about an hour to set until slightly firm. Then add just enough butter to coat the top of each container. 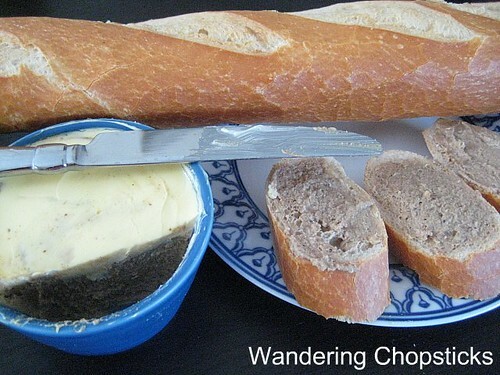 I used Shedd's Spread Country Crock for this so that I wouldn't have to wait for the butter to soften if I wanted to spread the pate right when I pulled it from the fridge. The butter also serves to seal the pate so it doesn't form a film or harden. Also, this way each time you take some pate to spread on the bread, you also get butter. Pate + butter = gooood. Eat plain spread on French bread. Or as a filling for banh mi. Who else made chicken liver pate? Amy of Nook and Pantry seasoned hers with thyme. 1 year ago today, a teppanyaki show at Shogun Japanese Restaurant - Pasadena. I can totally appreciate what you've done here...it's a great idea and a successful one! Yum! Chicken liver pate is my favorite pate! I've got to tell you - this is a MUCH better method than I used. Puree'ing RAW livers and squishing them with fingers through a fine sieve was not pretty at all. I still couldn't get over my phobia over liver. But maybe the soaking in soy milk would helps. I didn't know that can get rid of the 'liverness' from the liver. Thanks! I was sure how it'd end up at first, but the result was great. It didn't really occur to me either until I saw the chicken livers on sale for only 50 cents. Haha! Yeah, I don't have the fortitude for what you did. Nor does mine look nearly as pretty without that lovely parsley gelee. yuck! i hate that part in my sandwich. mmmmm....pate is so gooooood. Is most of the pate in Vietnam made like this from chicken livers? All the pate I get locally is the ones from duck livers. Not sure what Vietnamese pate is made of. This pate is my own recipe. A while ago my family can't decide what we like better, chicken or duck pate. We would have to make two kinds cuz mom likes the chicken, dad likes the duck. As they eat, they fight over which one is better. Now they just go buy it cause it's easier for them. I love your baguette and pate spread. looks good! I've got some at home, now I wish I brought it to work to eat. I'm not sure if this is a Vietnamese thing, but my mother would mix pate and pork, maybe shrimp?, spread it on bread and toast it. It's pretty good! That's how my sister and I still eat our pate, spread on banh mi slice horizontally, ground pepper and toasted! If only I had the luxury of both chicken and duck pate to taste and choose from! Lucky you! I still have another container in the freezer. You can try some on your next trip home. Sounds good. I've never tried it that way before. My mom makes a shrimp, carrot, mayonnaise toast thing that sounds a little similar. I hope you make one soon. That's all the components, well except for the head cheese. I haven't figured out how to make that yet. is that container still in the freezer?? I just made some of this and it tastes AMAZING. 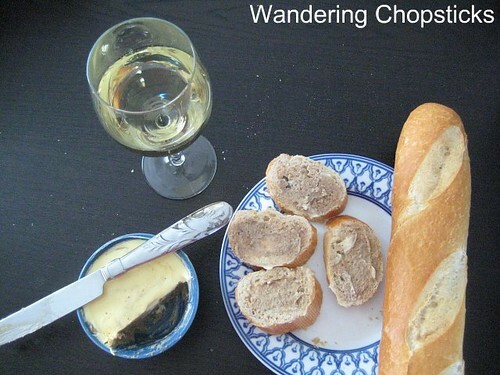 It definitely has a Vietnamese flavor that I miss in regular store bought European style pate! I think my next batch will have more liver and cognac instead of white wine. I have always been afraid of cooking liver but you've made it so easy and yummy! Thank you! That's wonderful to hear. Thank you! I've just discovered your blog and like it a lot. 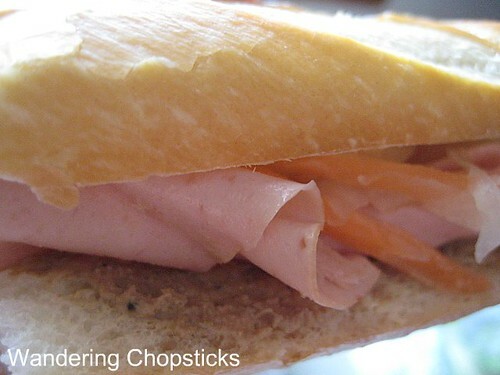 I'm so enthusiastic to make my own banh' my`, pickle, & pate tomorrow. However, my friend said that she has never been successful with U.S. chicken liver. She couldn't get rid of the liver odor no matter how hard she washed chicken liver with milk and wine. She suggested me to use pork liver instead. Is it true that your recipe could get rid of the liver odor? I really want to try your recipe but am afraid of taking risk. Is your friend only washing the chicken liver or soaking the liver in the milk overnight? Soaking the liver for longer will make it less "livery," but no amount of cooking will remove the taste completely. Liver is liver.